= While the entire route is approximately 12 miles, the trails themselves don’t gain or lose much elevation. If you can hike 10 miles, then you can hike this. The route does get a little wet in spots, especially on the upper part of the Lost Valley trail and down near the Mima Falls area. = The Falls Creek Trailhead provides plenty of parking, although it can fill up quickly on nice weekends. That being said, you can also park at Falls Creek Camp (open May through November) or some of the overflow areas nearest the trailhead parking. Margaret McKenny Camp offers less parking outside of the gate, however you can park inside the gate at the campground itself. I believe the gate closes at dusk, although a campground caretaker lives on-site year round so they can help you if necessary. Both trailheads (Falls Creek and inside the gate at Margaret McKenny Camp) have toilets. Signage along most the route is adequate. Just know that on the Lost Valley trail, you will need to hike up the forest service road for a little ways to reach the trail continuation. Mima Falls West features some nice bridges across the creeks and many sections of the route, especially those nearest the roads, are well maintained. 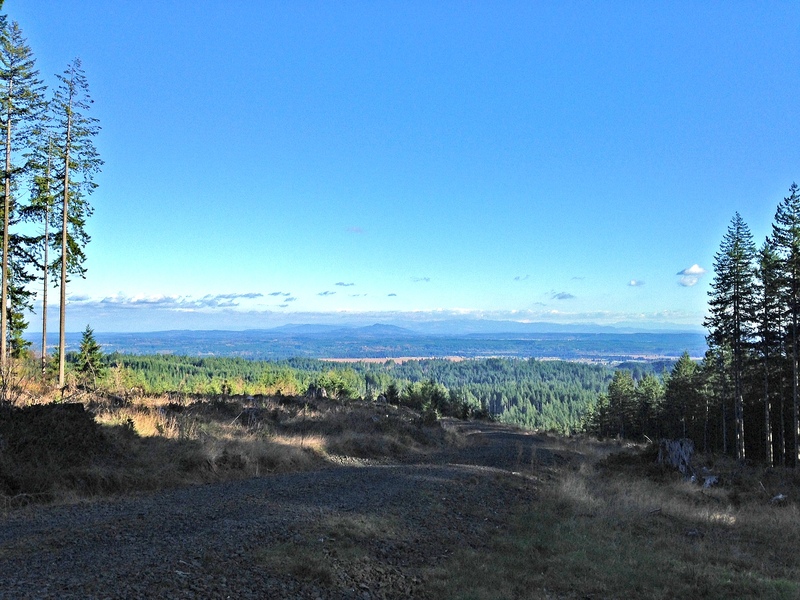 = Capitol State Forest is easy to access from the South Puget Sound area. If you live in Olympia/Lacey, you’re about a 30-minute drive. Its closeness makes it an easy weekend destination. Where: Capitol State Forest, Thurston and Grays Harbor counties, Washington. 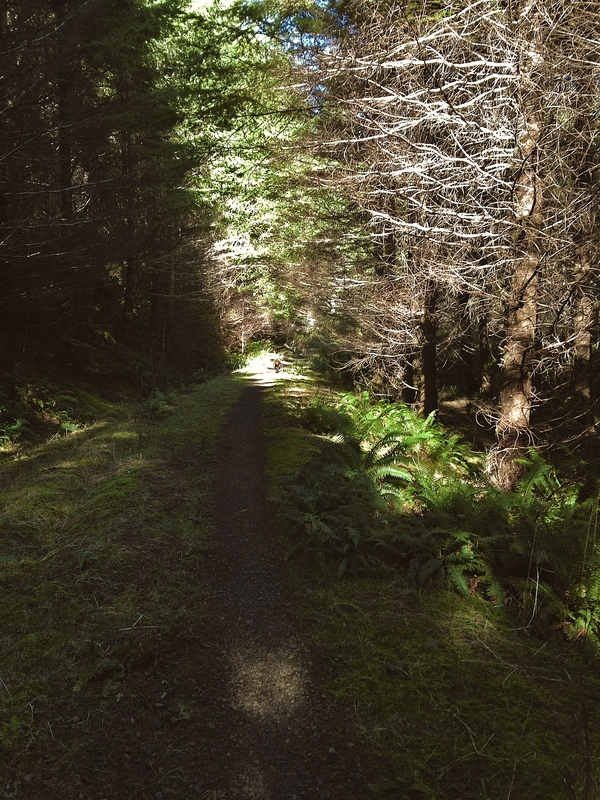 Access the state forest via the Delphi or Waddell Creek entrances on the east side. If you plan to start at Fall Creek Trailhead (recommended) then take Sherman Valley Road to the C-Line Road. Follow C-Line to the Fall Creek Campground/Trailhead turnoff (also known as C-6000 Road) on the left. Drive down C-6000 to its terminus and park at the Fall Creek Camp or Fall Creek Trailhead. 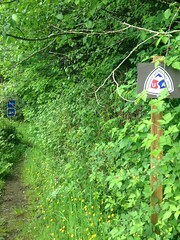 To reach the trailhead, hike across the Fall Creek Trailhead parking area to the south side and follow the signs. If you plan to start at Margaret McKenny Camp off of Waddell Creek Road, head south on Waddell Creek Road (from Delphi Road) to the second campground on the right side (just pass the Middle Waddell Trailhead). Since you will need either two cars or another driver to pick you up, I recommend ending at Margaret McKenny Camp so as to avoid driving the forest service roads late in the day. When to Go: The Lost Valley and McKenny trails typically receive little traffic, so don’t worry about crowds. Regardless of when you go, you may need to share the trail with mountain bikers and horse riders. This privately operated Capitol State Forest website offers great etiquette tips for hiking with bikers and horses. The trails do not offer many viewpoints so hiking them on clear days doesn’t matter quite as much. However, if you visit during hunting season (September through mid-December), make sure to wear some bright-orange clothing. Trail Information: Hiking the entire route will take 5-plus hours. Parts of the trails are muddy much of the year, however, a good pair of hiking boots will get you through fine. Starting at Falls Creek Trailhead, you will want to cross the creek and head southwest, taking a right at the first trail junction. Lost Valley trail explores some scenic woods. After making a bend, the trail will empty onto a forest service road. Follow the road to the left, up a hill, and you will find the trail again on the right after a quarter mile. At the trail junction with Mima Falls West, take a right turn. The path will follow along a pretty creek that offers a nice place for a break or lunch. Less than two miles later, the trail offers a rare view. From there, it continues on to Mima Falls, which provides another pleasant rest stop. 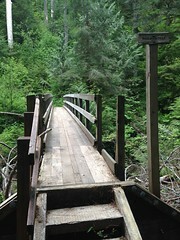 From there, you can take the shorter Mima Falls Tie trail to McKenny trail and back or take a longer route back via Mima Falls East and either the Equine Loop or Campground trail. Both are nice, though I personally prefer the scenery of the Mima Falls Tie. Lastly, I recommend downloading the DNR’s free mobile map of Capitol State Forest: it will make it infinitely easier to understand the state forest’s complex trail network. 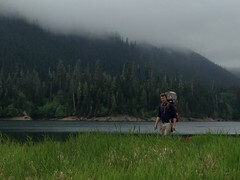 Tips and Notes: To use Washington State parks and forests, you will need a Discover Pass, which are available for a nominal fee. Washington Department of Natural Resources (DNR) workers check vehicles for these passes, especially during the weekends. Dogs are allowed at Capitol State Forest (and other Washington DNR properties). According to DNR rules, they must remain on leash. You will want to keep them under voice command if you let them off-leash though, especially on the Mima Falls West trail, which crosses the main road once. My dog is exceptionally skittish around horses so I leash her in the more popular horse-riding areas nearest Margaret McKenny Camp. These include the Equine Loop, Mima Falls East and Campground trails, and the end section of McKenny trail. Lastly, if you’re looking for reasons why to hike this far, or just need some help getting up your gumption for this or a similar trek, know that the challenge and peacefulness of hiking not only offers plenty of physical health advantages but also some amazing mental health benefits, including increased creativity and increased happiness, according to studies. So happy (and creative) hiking! Planning to check out Lost Valley, Mima Falls, or Capitol State Forest? Use some of the resources below. Trail Map (identifies trails that author took): Trail and Road Map of Capital S.F. Campground and trail statuses for Capitol S.F. Viewpoint along Mima Falls West.